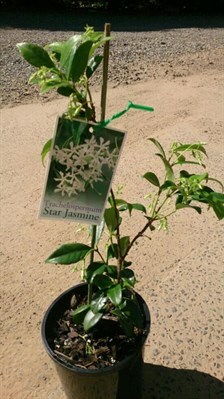 Commonly known as Chinese Star Jasmine. Trachelospermum jasminoides is commonly grown as an ornamental plant and houseplant. In gardens, public landscapes, and parks it is used as a climbing vine, a groundcover, and a fragrant potted plant on terraces and patios. It will flower in full sun, partial shade, or total shade, and requires well-drained soil , moderate water, moderate fertilizer, and a climbing structure such as a trellis.